When we launched author profile pages in July of this past year, our goal was to create a site for each Tableau Public author where they could showcase their best work. That was five months ago, and now we'd like to reveal the profile pages of our authors that have been viewed the most since launch. 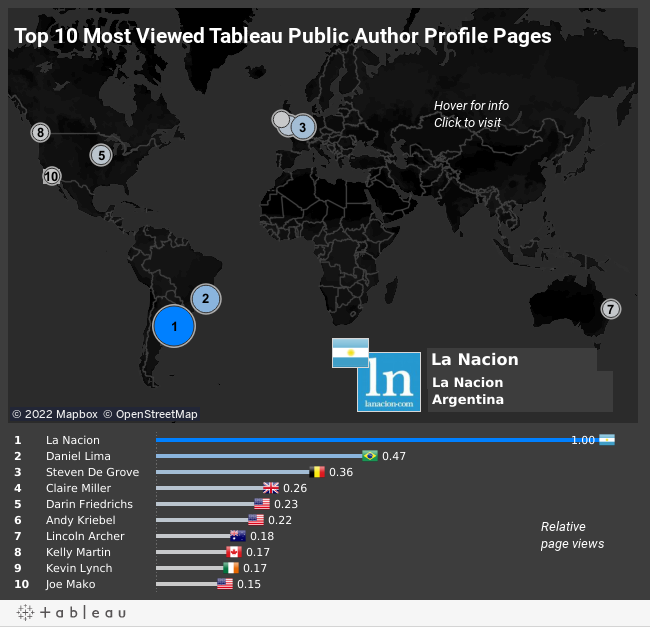 The most viewed author profile page belongs to Argentina's La Nacion! The data journalism team at La Nacion in Buenos Aires is an award winning outfit, and one of the three finalists at this year's Online Journalism Awards, along with the Boston Globe and the New York Times. Congrats to Momi, Flor, Gabi, Yanina and the whole team at LN Data! It's remarkable to note that the 10 top author profile pages belong to authors from 8 different countries, illustrating the fact that data visualization is truly a global phenomenon. The top authors include award winning data journalists like Claire Miller of Wales, Tableau Zen Masters like Andy Kriebel of Facebook in the US, and data bloggers like Kevin Lynch of Ireland. Our top guest blog post writer, Canadian Kelly Martin of Viz Candy, is also in this list, coming in at number 8. Look for us to continue to develop these author profile pages in the new year. We have plenty of ideas, and of course we would love to hear what you think we should do to build on them. For suggestions, email us at tableaupublic@tableausoftware.com. Lastly, a huge congrats to all ten of these Tableau Public authors! We admire your work, and we're looking forward to seeing what you create in 2014. I was not able to download the file nor able to see individual blogs of Top 10. Can someone help me to see all the Top 10 profile page links ? Hi Hari, you should be able to download the workbook now. Also, clicking on each circle on the map should open a new browser tab with the profile page. You may need to make sure pop ups aren't being blocked.